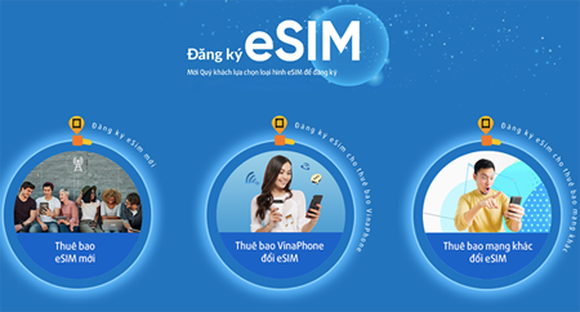 VinaPhone, a subsidiary of the Vietnam Post and Telecommunications Group (VNPT), announced that in February 2019, it is going to offer eSIM (embedded Subscriber Identity Module) to its customers. They can choose between two forms of either exchanging an eSIM, applied to those owning a normal physical SIM and not requiring customers to visit a VinaPhone store, or obtaining a new eSIM, applied to those wishing to have a new mobile phone number. Both will receive a free eSIM. Besides launching an online portal for eSIM registration, VinaPhone also provides aid on activating eSIM for its customers. At the moment, eSIM can be used on certain iPhones like XS, XS Max, and iPhone XR that supports eSIM, all of which should run on iOS version 12.1 and above. The advantage of eSIM is that it is embedded directly onto the hardware of a mobile phone, and users only need to perform a few simple steps to activate its functions, which work quite similar to current physical SIMs. There are more than 10 nations in the world where eSIM is supported, including the UK, the US, Singapore, the Czech Republic. In Vietnam, VinaPhone prepared for this new technology in September 2018 and is going to formally launch it from February 2019. It is the first in the country to allow customers to pre-order eSIM.